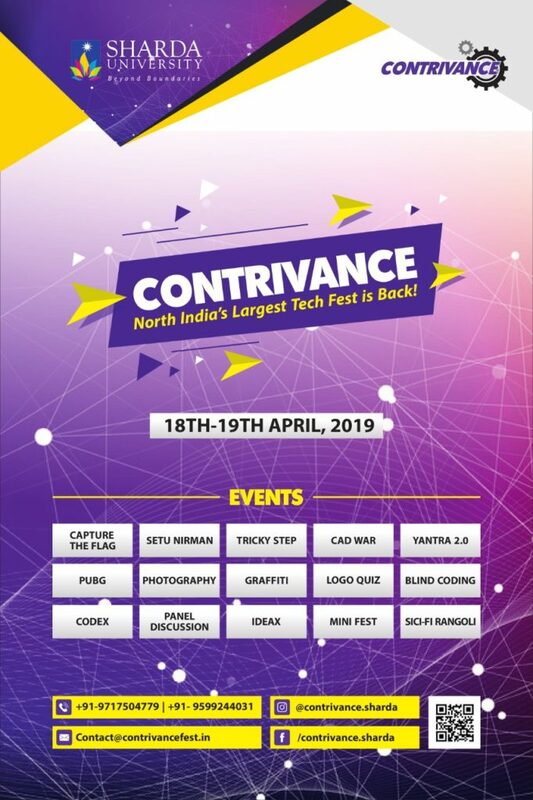 Contrivance started in 2014 as a Technical festival of Sharda University has emerged to be North India’s Largest Techfest, a conglomeration of scientific thinking and innovation. With a foot in every genre, the fest caters to an audience of 10,000 and more, one of the largest college gatherings across north India. It provides a platform for one and all to witness one of the most beautiful and groundbreaking amalgamations of science and technology with pure delight and enthusiasm. Technical Fest plays an important role in college Life. It is one such event where young brains get to showcase their skills and compete with others to find the best. It is not just about the competitions but also a place where all new ideas can be seen live and participants learn more and be inspired. YANTRA: An event for Robot Fetishistic where they can show how efficient their Robo is. SETU NIRMAN: An event to design a truss bridge using ice cream sticks satisfying the stated constraints. CAPTURE THE FLAG: Task is to look for clues to dig the answers and the only medium would be the computer. MECH EXHIBITION: Showcase of Sharda built all-terrain vehicles made by the students. CONSTI IQ: A legal knowledge quiz to test a student’s legal awareness. MOCK IPL: An IPL auction in which the one with the best team wins. Register yourself and Join us! “Future of Building Information Modeling (BIM) – ArchiCAD” for the 3rd year students of B.Arch. SOP is organizing a Campus placement for D.Pharmacy students on 20th, April 2019. The main objective of campus placement is to identify the talented and well-qualified professionals before they complete their education. To provide employment opportunities to students who are in the final year of Diploma in Pharmacy. To reduce the time for an industry to pick the candidates according to their need. To make students understand the importance of placement training that is being imparted, whether it is an aptitude training or soft skills. Venue: Room No 404, Block-4, ( Fourth Floor), Sharda University. School of Allied Health Sciences (SAHS), Sharda University is organizing ‘Parent-Teacher Meeting (PTM)’ on 20th April, 2019 (Saturday). Parents of SAHS students are cordially invited to attend the “Parent – Teacher Meeting (PTM)”, to discuss regarding attendance & performance of their wards with teachers and to discuss about the overall performance of the student. School of Education (SOE) is organizing Parent Teacher Meeting (PTM) on 20th April, 2019 to discuss the overall performance of the students with their parents/guardians. Discuss the attendance of the students. Discuss the overall academic performance of the students in class and other academic related aspects. School of Law, Sharda University is organizing a meeting of ‘Journal Club’ on Saturday, 20th April, 2019 at 11 am in Legal cell. SOL is organizing a meeting of ‘Journal Club’ on Saturday, 20th April, 2019 at 11 am in Legal cell. The objective of the Journal Club is to provide a platform for the purpose of disseminating/ sharing knowledge among Faculty Members and Ph.D. Scholars in the area of Law and its related areas. “Issue of Jurisdiction under the Information Technology Act,2000”. School of Humanities and Social Sciences (Old name SOLC) Sharda University is organizing their Journal Club meeting on Saturday, the 20th April, 2019. @ Faculty Board Room, 8th Floor, Block 7, PGDM Building, Sharda University. School of Humanities and Social Sciences (Old name SOLC) Sharda University is organizing their Journal Club meeting on Saturday, the 20th April, 2019. To provide a platform for faculties/ research scholars to share knowledge on varied ideas related to literature and culture, mythology, gender, psychology and other areas of diversity. Prof. P. K. Mitra, Dean, School of Humanities and Social Sciences. Ritu Sharma, Research Scholar, Humanities and Social Sciences,08800499974. Venue: Faculty Board Room, 8th Floor, Block 7, PGDM Building, Sharda University. This is our immense pleasure to inform you that School of Nursing Science And Research in Collaboration with Kartavya Group (NGO) is organizing Health Game on World Health Day with the theme “Universal health coverage: everyone, everywhere” on 22 April 2019. The World Health Day is a global health awareness day celebrated every year on 7 April, under the sponsorship of the World Health Organization (WHO), as well as other related organizations. Universal Health means that all people have access, without any kind of discrimination. Health game actually means the physical activities that people love to participate and enjoy, also makes them healthy in the process. People who want to involve in heath related activity should try to be organized, skilful and should also be committed to fair play. People usually indulge in sports activities for fun and to get the physical exercise that they need to stay healthy. To advocate and educate all on how to get and stay healthy. To achieve a health-enhancing life of physical activity. To provide for a safe physical environment. To provide a variety of activities that will enhance life – long learning and participation.